To understand how you can build a Schmitt trigger using a voltage comparator, you should first take a look at the voltage comparator circuit. A voltage comparator compares two voltages and returns as a result which voltage is higher. 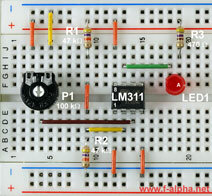 If the voltage at the (+) input is greater than that at the (-) input, LED1 remains dark. If the voltage at the (+) input is smaller than that at the (-) input, LED1 lights up. The voltage comparator is therefore not a Schmitt trigger! How do you turn a voltage comparator into a Schmitt trigger...? 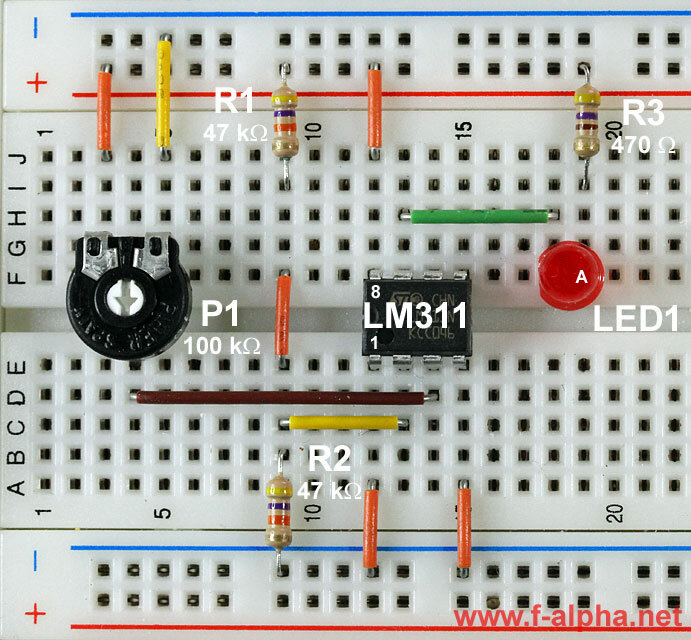 You find more information about the LM311 and more voltage comparator circuits under the topic "comparator".